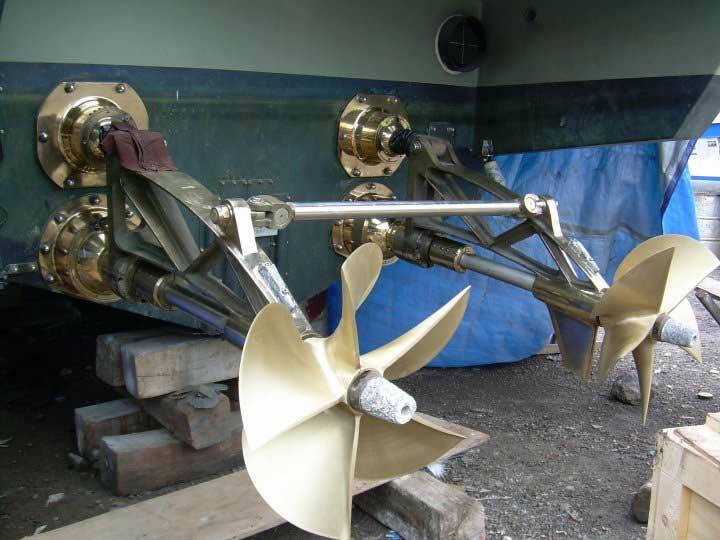 Surface Drive is dedicated to fast motor boats as the most effective of all the types of drives; however, as every drive, it has its limitations of use. It may not be used for bay watch rescue boats due to the risk of injury (as other drives, except for water jet). 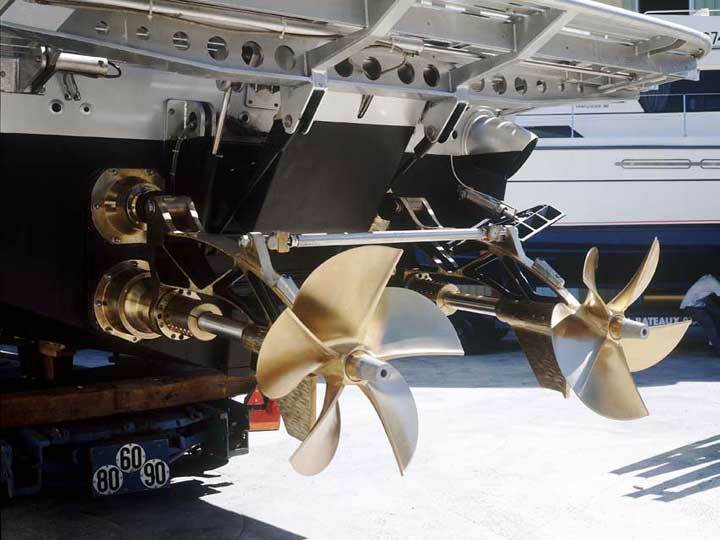 It is precisely due to the risk of injury in the case of falling out of the stern of the boat that the SDS drive (just like stern-drive) requires installing the platform to the transom. The hull of the boat must operate in planing. There are two types of such hull: fixed angle (monohedron) where the maximum draft of the boat is on the transom, and variable angle (warped) where the maximum draft of the vessel is on the amidship. 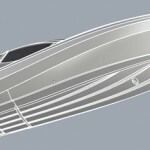 Each of these hulls has its own work specifics related to the shape and hydrodynamic resistances. The hulls may work in a single system (monohull), double system (cat) and triple (trimaran). Monohedron hull is dedicated to fast motor boats, especially to operating in rough waters. 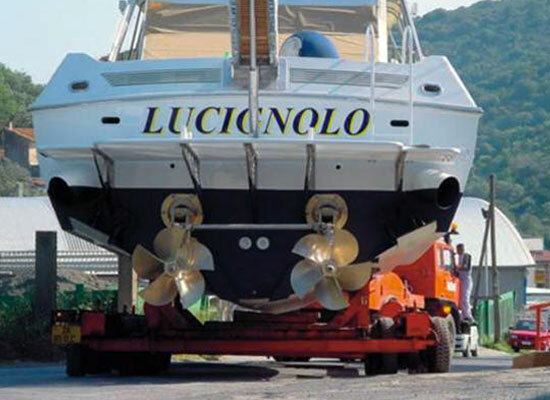 The maximum speed for this type of hull is approximately 90 kn, above which the hull starts chain walking and it is endangered by losing stability, especially at shifts of the centre of gravity, which in principle is located at between 25 % and 38 % of load waterline length (LWL). The second type of hull to be used with Surface Drive is “warped hull”. The maximum speed for this type of hull is 40 kn, above which it is prone to losing stability, especially when LCG (centre of gravity) is over 40 % LWL . A positive feature of this hull is its higher resistance to bouncing up in rough waters in comparison to the previous one. This hull also has a greater tolerance for changes in weight distribution on deck to the specified speed. The surface drive may work with any type of stationary engine (via reduction gearbox). It is most frequently used with diesel engines, which in principle have lower rotation speeds (lower reduction on gearbox – lower cost). As it has already been mentioned and described further in detail, there are two types of SD drives: fixed and trimmed, which we offer. You will find a comparison of producers of both drive types as you read on. 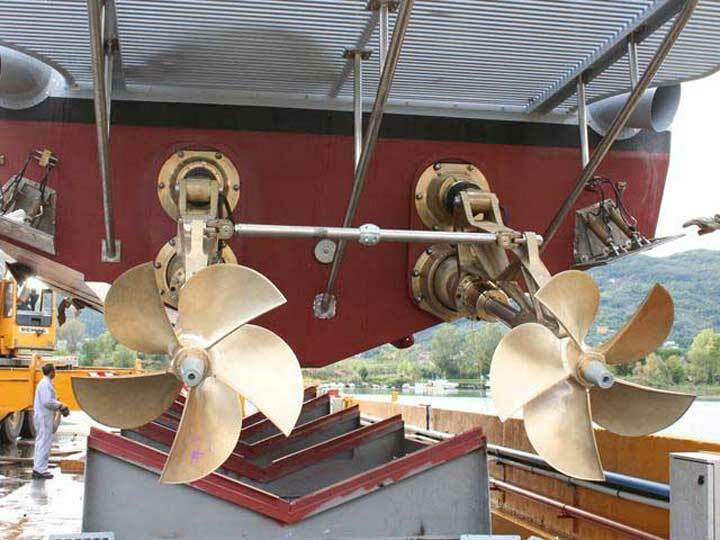 There is also a description of all the most common types of drives for motor boats. 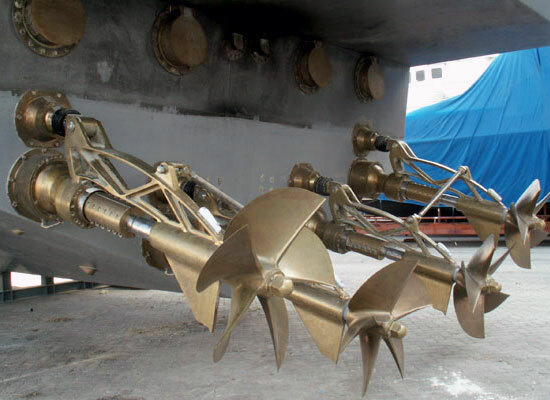 Surface drive works effectively at the speed range from 20 to over 80 kn, and it generates the lowest hydrodynamic resistances of all the types of drives (no stern). 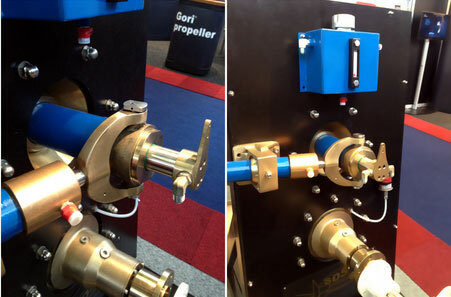 Replacing a drive with SDS means at least 15 % of increased vessel performance and a decrease in fuel consumption. In contrast to water jet, which has considerable power losses on drive and a high probability of failures resulting from dirty material pulled to the dredge box, SD drive does not have these defects. 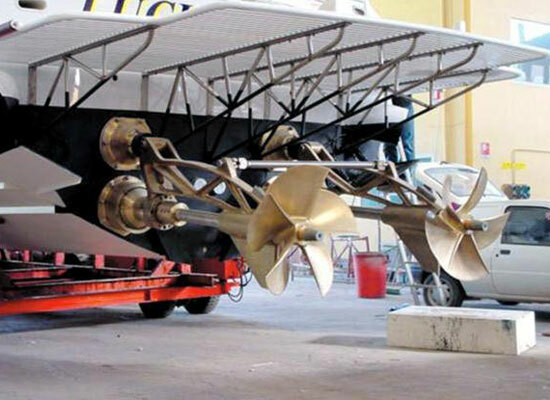 Its massive propeller with a fin easily handles all dirt or sand in the shallows. Each type of drive has its advantages, but SDS is unbeatable when it comes to performance. In addition, it has the easiness of dealing with various loads, e.g. while operating at rough sea. Each SDS model has the same components. The drive is a mechanical system which transfers kinetic energy to the propeller. The system consists of 6 main elements: a steering cylinder, a trim cylinder, a lower sphere unit, a thrust box unit, a drive shaft and a frame. The hydraulic cylinder, working perpendicularly to the drive shaft, is responsible for the horizontal movement (inclination of 19 degree angle) and turning. This cylinder is connected with the cylinder responsible for lifting and lowering of the unit (trimming). 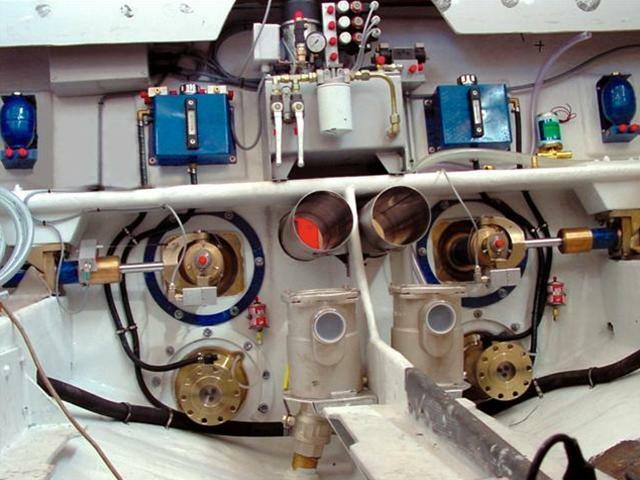 The picture shows a complete drive from the engine room side, with lubrication points.